The adjustable electrical contact thermometer is a very efficient and highly sensitive instrument that is ideal for temperature control. Operating ranges are from -39°C/-38°F to 400°C/752°F. These thermometers have two scales: the lower indicates the actual temperature of the system under control while the upper scale is used for setting the required operating temperature. The setting is effected by rotating the magnet on the top of the thermometer which moves the index marker up or down. A fine contact wire is fixed to the marker; its end reaches the lower thermometer scale and will point to the same temperature as set on the index marker. In operation, the mercury rises until it reaches the temperature to be controlled when it will then close a circuit on an interposed relay. If operating conditions demand it, the switching can be revised. 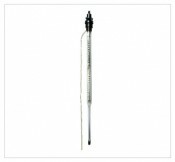 The Fixed-Contact thermometer is the simplest form of accurate temperature control and is ideal for use for constant control at a pre-set temperature. The thermometers are neat yet robust in design and are available in insulated and non-insulated patterns for temperatures up to 300°C or Fahrenheit equivalent. Immersion lengths, whether straight or angular, with or without protective frame and number of contact points can all be manufactured to customers' requirements. When ordering please specify temperature setting required, immersion length and length of lead. Normal accuracy is to ±0.05°C/0.1°F.